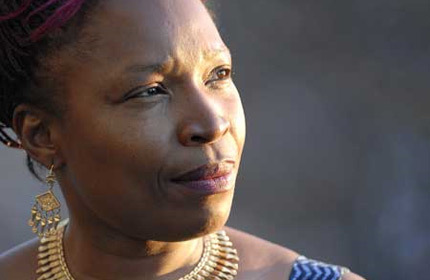 Fanta Régina Nacro was born in 1962 in Tenkodogo, Burkina Faso. She entered into the world of cinema through the great gate. This desire for cinema lead her to INAFEC of Ouagadougou, the mythical African film school in which several generations of African filmmakers attended. There she received her first degree in audiovisual science and techniques. In 1986 she earned a Master’s Degree in Film and Audiovisual Studies at the University of Paris IV and in 1989 she received a diploma in filmmaking at the Sorbonne. In 1993, she founded her own production company, Les Films du Défi, located in Ouagadouogou. She currently is studying for a doctorate in Education. Fanta Régina Nacro is among the celebrated filmmakers who are part of Scenarios from Africa, a community mobilization, education and media process about HIV/AIDS carried out with and for young people. Scenarios from Africa gives children and young adults an exciting opportunity to educate themselves and others about HIV/AIDS by inviting them to participate with internationally acclaimed directors in the production of a growing collection of short films. “Tiger, Tigress” is a provocative comedy that takes a critical look at some of the things that make women vulnerable to HIV infection. A truck driver named Morpheus, who has a woman at every truck stop, suddenly finds himself in a world turned upside down: a world in which women reign supreme in society and call all the shots. The story is based on an idea written by Marlène Amégankpoé, aged 21, of Benin, during the last Scenarios from Africa scriptwriting contest.